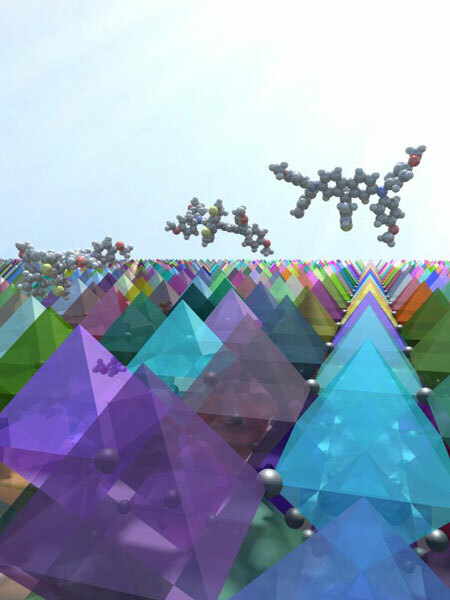 Some of the most promising solar cells today use light-harvesting films made from perovskites – a group of materials that share a characteristic molecular structure. However, perovskite-based solar cells use expensive “hole-transporting” materials, whose function is to move the positive charges that are generated when light hits the perovskite film. Publishing in Nature Energy (“A molecularly engineered hole-transporting material for e cient perovskite solar cells”), EPFL scientists have now engineered a considerably cheaper hole-transporting material that costs only a fifth of existing ones while keeping the efficiency of the solar cell above 20%. Some of the most interesting properties of nanoparticles emerge when they are brought close together — either in clusters of just a few particles or in crystals made up of millions of them. Yet particles that are just millionths of an inch in size are too small to be manipulated by conventional lab tools, so a major challenge has been finding ways to assemble these bits of gold while controlling the three-dimensional shape of their arrangement. Enter the nanoparticle equivalent of the printing press. It’s efficient, re-usable and carries more information than previously possible. In results reported online in Nature Chemistry, researchers from McGill’s Department of Chemistry outline a procedure for making a DNA structure with a specific pattern of strands coming out of it; at the end of each strand is a chemical “sticky patch.” When a gold nanoparticle is brought into contact to the DNA nanostructure, it sticks to the patches. The scientists then dissolve the assembly in distilled water, separating the DNA nanostructure into its component strands and leaving behind the DNA imprint on the gold nanoparticle. This is a gold nanoparticle, brought into contact to a DNA nanostructure, sticks to chemical patches. Scientists then dissolve the assembly, separating the DNA nanostructure into its component strands and leaving behind the DNA imprint on the gold nanoparticle. Some of the properties of gold nanoparticles have been recognized for centuries. Medieval artisans added gold chloride to molten glass to create the ruby-red colour in stained-glass windows — the result, as chemists figured out much later, of the light-scattering properties of tiny gold particles. Essay contest: What does the fourth industrial revolution mean to you? This article is published in collaboration with Medium. We are inviting essay submissions of up to 900 words on the theme of the Fourth Industrial Revolution. A shortlist of five essays will be published on the World Economic Forum’s Agenda blog platform, which is read by 1.5 million people a month. The winning essay will be shared with delegates at Davos and promoted across our social media channels during the meeting, while the winner will receive a signed copy of Professor Klaus Schwab’s book. 4. The deadline for submissions is December 31st. The shortlist will be announced on Medium and Forum Agenda on January 11th, and the winner on January 18th. 5. The contest is for members of the public. World Economic Forum staff and constituents are not eligible. Author: Ceri Parker is Commissioning Editor at the World Economic Forum.